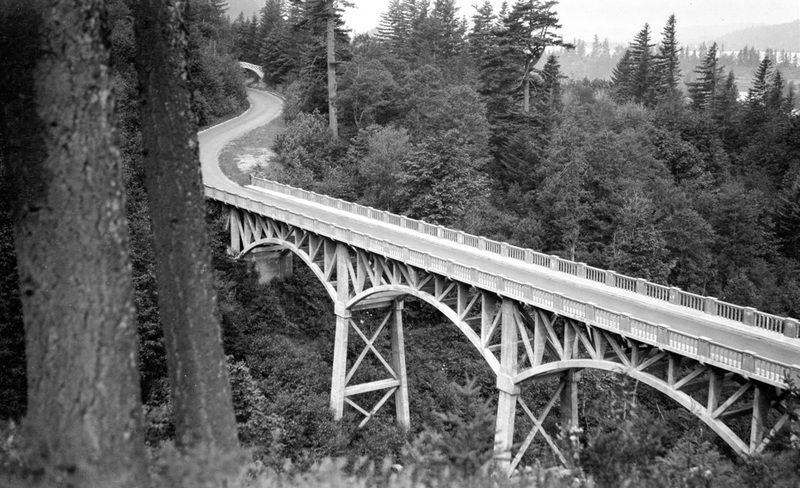 Here's the Latourell Creek Bridge on the Columbia River Highway back when it was new, as photographed by Albert Kollas. The bridge is 316' long and 25' wide. I chuckled when I saw that, since it is wider than the Hood River White Salmon Interstate Bridge. Nice photo! You can also see part of the arched footbridge that once carried hikers on the loop trail over the highway. The bridge abutments from the structure are still there, covered in moss and ferns. The artistry of that era's infrastructure was really something. I once worked for a power company in the Midwest, and loved wandering through the hydroelectric powerhouses built around 1915-1920. They had such intricate terrazzo tile and stonework. Can you imagine the reaction of taxpayers today if any govt agency tried that? Thanks for pointing out the fact that it is wider than our WS/HR bridge. I would not have known that was a footbridge in the background. "....Latourell Creek Bridge is the only braced-spandrel concrete arch on the State Highway System. Its spare, clean and economical shape results in a lightness of structure akin to that found in steel. The braced-spandrel framing is usually found only in steal deck arch construction. The X-braced towers carry the comparison to steel even further......This bridge was designed by K.P. Billner who was the ”first American engineer to break entirely with tradition and treat the concrete arch as a distinct kind of structure comparable in its behavior to the elastic ribs of steel” that had become popular in the late nineteenth century....."
There is a K.P. Billner who patented dewatering of concrete in 1935. "...Dewatering can produce impressive strength gains. In Sweden, the method is now used for 40 to 50 percent of all floors...."
I assume it is the same person that helped design this bridge. Do you think that is Rooster Rock we can see through the gap in the trees? Karl P. Billner designed all of the reinforced-concrete bridges and viaducts along the Columbia River Highway segment in Multnomah County. He was born in Sweden in 1882 and was a 1906 graduate of the Chalmers Technical University of Goteborg. Billner came to the United States and, as a bridge engineer with the Oregon State Highway Commission, supervised construction of the first reinforced-concrete bridges in Oregon on the Columbia River Highway in 1913-14. These include many one-of-a-kind spans, such as Crown Point Viaduct, Latourell Falls Bridge, Shepperds Dell Bridge, Bridal Veil Falls Bridge, Multnomah Creek Bridge, and the Benson Footbridge at Multnomah Falls. He also designed several reinforced-concrete beam bridges and viaducts. These include the West and East Multnomah Falls Viaducts, Oneonta Gorge Creek Bridge, and the Horsetail Falls Bridge. After a brief stay in Oregon, Billner moved to the eastern United States, where he went on to experiment with various methods of concrete construction. He became president of the Vacuum Concrete Corporation in 1935, where he perfected a vacuum method for drying concrete by extracting excess water with a vacuum pump. This process greatly increased concrete’s strength. Billner went on to receive the Frank P. Brown Medal from the Franklin Institute in 1947 and the American Concrete Institute’s Gold Turner Medal in 1962. He died in 1965 in Philadelphia, where he had resided for many years. and while narrow,, it appears that there is room for a ped to walk on a raised walkway...unlike the HR/WS bridge. Thanks Arthur for the Karl Billner biography. Some pretty amazing people that I have never heard of, just fade into history.